Since debuting at the D.C. Black Film Festival in August 2017, "Page One" has been taking the independent film circuit by storm! 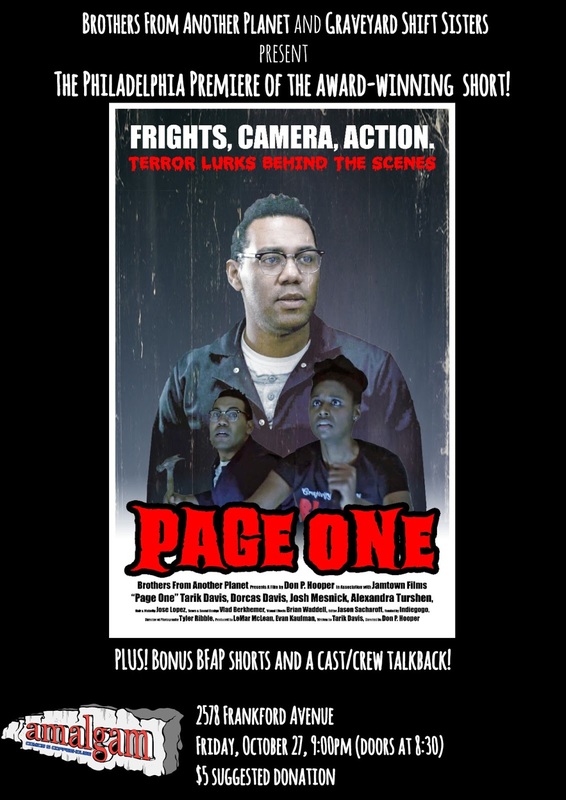 The horror-comedy short film has already garnered a Gold Award from the Spotlight Horror Film Awards in Atlanta, GA and most recently Best Screenplay at the New Jersey Horror Con and Film Festival. This award winning short films Philadelphia debut will be hosted by Amalgam Comics and Coffeehouse on October 27, 2017 at 9:00pm! This fresh blend of horror and comedy is co-produced by Brothers From Another Planet and ELK Productions, in association with Jamtown Films. Brothers From Another Planet is a trio composed of producer LeMar McLean, director Don P. Hooper, and writer/lead actor Tarik; they host the Brothers From Another Planet podcast about race and entertainment and perform regularly in New York City in the show CPT: Comedy People's Time. The debut screening is a must see! Also featured at the event are additional shorts from Brother's From Another Plant and a talkback with the cast and crew! Doors will open at 8:30pm for this event, presented by Brothers From Another Planet at Graveyard Shift Sisters, and the screening will begin at 9:00pm. There is a $5 suggested donation for this debut screening. Amalgam Comics and Coffeehouse is located at 2578 Frankford Avenue Philadelphia, PA 19125.